Woodhall Manor is the perfect venue if you’re dreaming of a traditional English country wedding in the glorious Suffolk countryside. Our team have put together our favourite top tips to help. 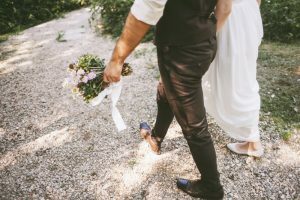 It’s important to get the balance right so that you host a wedding that is suitably rustic, but that still feels as gloriously special and glamorous as you’d wish for on your wedding day. The beauty of a country-style wedding is that you can make it as relaxed, or as traditional as you wish. With a historic Manor house dating back over 450 years, with fabulous gardens and a venue space that can accommodate a good size wedding party you shouldn’t be stuck for space and you have the best of both worlds. With plenty of farms and local food producers in Suffolk, you’ll have no trouble finding locally sourced produce for your wedding. In the summer and autumn months, you’ll find plenty of local fruit and vegetables that can form the basis of your wedding breakfast. With fresh berries in abundance, you can use them as a dessert in a traditional Eton Mess, or enhance glasses of champagne or seasonal cocktails. In the cooler seasons, embrace autumnal apples, blackberries and pears to make wonderful hearty English desserts such as crumbles and pies. Serve as individual portions for a more elegant feel. Traditionally, English country weddings are associated with delicate pastel flowers as well as wildflowers. For an alternative to traditional centrepieces and arrangements, display bunches of blooms in mismatched vintage china, in jam jars or even empty bean cans for a rustic touch. A floral archway and decorated pillars look truly stunning in the ceremony room. Use English flowers such as roses, peonies and ranunculus for a romantic, whimsical look. On the end of the chair rows and in bouquets, tie your flowers with romantic lace or rustic hessian to keep to your country theme. 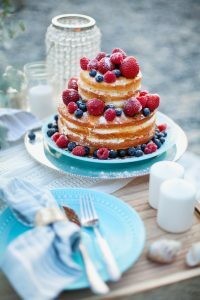 Your wedding cake will be the centrepiece of your reception so opt for something truly stunning yet natural with an un-iced, natural wedding cake liberally covered in fresh seasonal berries. If you don’t want a traditional tiered cake, why not choose a stack of cupcakes decorated with pastel buttercream so that guests can help themselves to a colour of their choice? A very popular alternative at country weddings is a cheese wedding cake where whole cheeses are stacked to look like a traditional wedding cake. Served with fresh bread, crackers and homemade chutney it’s also a great option to bring out during the evening when guests start to feel peckish and want to graze. When it comes to the decor, your country theme is so easy to embrace throughout any venue. In the garden, scatter hay bales covered in throws so that guests have somewhere to perch and enjoy their fizz! Use lanterns and tealights to create pathways, and a wonderful ambience as dusk falls. 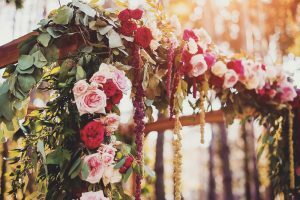 Rustic jugs and pots, and of course plenty of colourful bunting will all add to your magical English country wedding setting. Use rustic crates and barrels to use as side tables for the guest book and drinks stations. You can also fill wheelbarrows with drinks, and provide chalkboards with handwritten signs directing your guests towards the food. Woodhall Manor can offer plenty of guidance and if this is your theme ask about our Festival Wedding Collections. If you really want to push the boat out choose an ‘Atelier’ style Stretch Tent with Gin & Tonic Station, Live Band, Magician and Fireworks in the garden – it will look stunning! Your English Country Wedding is only limited by your imagination. With a wealth of experience and a passion for delivering memorable moments for all our couples, our team would love to give you a tour of our beautiful Manor House, venue and gardens. Give us a call on 01394 411 288 or email info@woodhallmanor.com to arrange your private tour now!